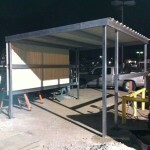 We built 3 very large free standing commercial carports for Wulfe & Co., a real estate company located by the Galleria. 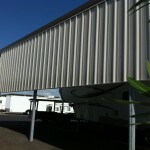 The carports are galvanized frames with painted white sheets. 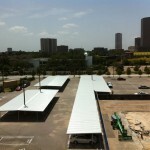 Look how we incorporated the light poles! 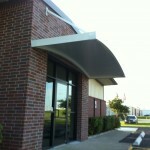 Here is a steel walkway cover we did for a daycare to cover the walkway from the main building to the other classrooms. This is The Wiggle Room Daycare in Pasadena. 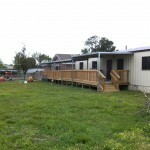 If you’re looking for a place to keep the little ones where they can play and learn, this is it. We built a free standing awning for Red Ball Oxygen to give those guys some shade when they re-fill their propane bottles. It’s partially walled down on one side to further protect from the weather.